People who keep llamas as pets will readily offer you any number of reasons: llamas are quiet, they’re gentle and affectionate, they don’t take a lot of work to maintain and, for outdoor animals, they don’t smell bad. But it’s more than that. Look at a llama and it’ll gaze back sympathetically with those huge, beguiling eyes, ears perked up, looking for all the world like it understands you and really cares about your problems. 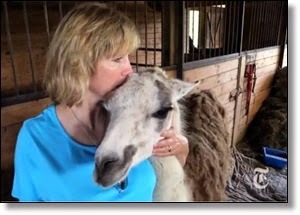 To read more on this story, click here: Pets: The Llama Is In FOLLOW US!